For an organization, it is extremely vital that their employees are regular and punctual at their work since it maintains the work environment of the organization and also maintains the decorum of the Institute as well. Employees are given leaves and off days according to the rules and regulations of the organization, but making sure that the employees aren’t taking any extra days off, is also important. Employee attendance record sheet is a document or sheet that is used for marking the presence, absence, sick leave, objects of employees for payroll or the purpose of salary. Every administration of offices is required to keep detailed records of employee attendance. In the time before, the employee sheets were in register form but now in this modern world everything is in the form of electronic so now employee attendance record sheet is also in electronic form. To make sure that the employees are on time, a tracker should be made in use. This tracker will note down the attendance of every employee in the organization and would directly report to the supervisors and managers. The tracker should be such that every employee upon entering the office should mark their attendance, either by signatures or by an electronic system. At the end of the day, there should be a report to tell how many employees were present and how many of them were absent. Then there should be a report of how many employees that were absent was on a notified leave and how many of them took a day off without reporting. This would help the organization in taking measures accordingly. The tracker could also keep track of all the employees that came in late. This could be by adding a time column to the tracker or if done electronically, there should be a time limit as to after this time; the employee will be marked as a latecomer. It is vital that the tracker is maintained on a regular basis. Below we have mentioned some benefits of recording attendance of employees. The main reason for recording employee’s attendance is that in one roof where many people work together can have some issues too, so a manager is able to address potential attendance issue by having a record of attendance. By attendance records the manager can ensure about the rules of office are not getting misused. Attendance recording is of most importance for paying salaries. Attendance record will determine about employees are getting paid full and on time. Having a perfect record of attendance will also ensure the work standard of every department. 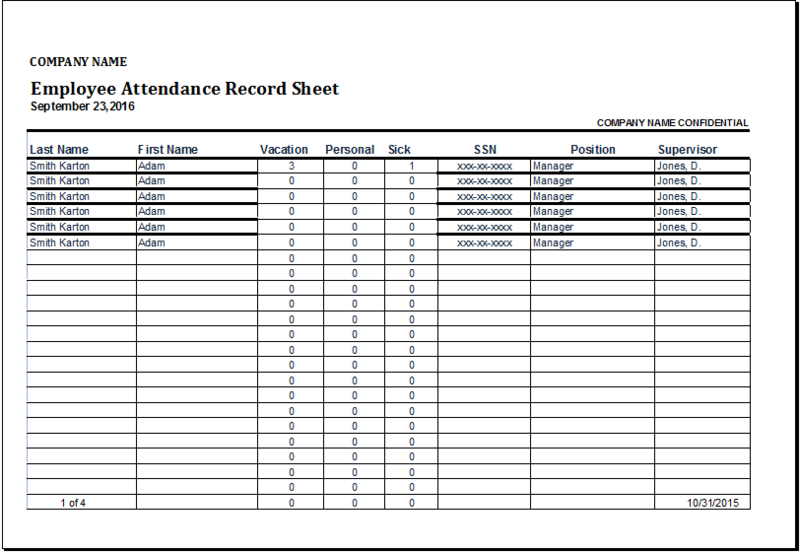 Accurate attendance records also help in reviewing about leaves of employees if they submitted. Employees will be much satisfied if the working schedule will be accurate, so they can have off time for any of their personal business. The productivity of work just depends on the accuracy of work and work will be done when the attendance is accurate and much to complete the entire essential work in offices. If the record of attendance will be accurate, then it can decrease the rate of absenteeism in office, if the number of absent is much higher so the managing department can take notice of it. The records of attendance will be a perfect proof for salary and hour audit or lawsuit. If you will have perfect attendance record so the employees can’t claim about time off support. Attendance tracking will make it much convenient for scheduling vacations. If the attendance records will be accurate and perfect than the management can create greater plans for vacations.